Chady is a Registered Physiotherapist. He graduated from the University of Ottawa with a Bachelor of Science in Physiotherapy after receiving a Bachelor of Applied Science in Computer Engineering. At the post-graduate level he has completed a comprehensive evidence based medical acupuncture course at McMaster University and has been integrating acupuncture into his treatment plans ever since. He has also completed all the available, post-graduate level courses in Mechanical Diagnosis and Therapy with The McKenzie Institute International. He is currently working towards a Diploma of Advanced Manual and Manipulative Therapy. Using a combination of manual therapy, electrotherapy/modalities, specific strength training, core conditioning and education, Chady works closely with his clients, ranging from children to adults to senior citizens, to develop effective evidence-based treatment plans that are specific to their goals. Chady is currently not seeing any patients at this time due to an injury. We wish him the best of luck in his rehabilitation. Elie is a Registered Physiotherapist. He graduated from the University of Ottawa with a Bachelor of Science in Physiotherapy. At the post-graduate level he completed and received his certification in Evidence-Based Medical Acupuncture from McMaster University and is certified with the Canadian Academy of Medical Acupuncture. Elie has also attended many post-graduate courses, with topics on shoulder injuries, spinal derangements, muscle imbalance, and sports rehabilitation, only to name a few. He is currently working towards a Diploma of Advanced Manual and Manipulative Therapy. Elie is very active in his community and has a strong exercise prescription background. He enjoys treating people of all ages whose injuries vary from those sustained from repetitive stress, motor vehicle or work related accidents, sports related activities or chronic injuries. Fadi graduated from Queen’s University with a Master of Science in Physiotherapy. Prior to this, he graduated with a Bachelor of Science with a Specialization in Human Kinetics from the University of Ottawa. 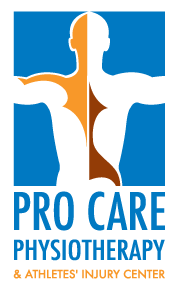 He joins Pro Care Physiotherapy & Athletes’ Injury Center’s health care team after having gained experience while working along and treating a variety of clients, such as children, the elderly, as well as Olympic athletes, only to name a few. Fadi uses manual therapy, exercise prescription and the latest evidence-based treatments to treat his patients and is always looking to advance his arsenal of treatment tools to get his clients feeling better as fast as possible. He will be completing the Evidence-Based Medical Acupuncture program at McMaster University and has a keen interest in courses on advanced techniques to treating complex lower back injuries as well as to the upper and lower extremities. Fadi enjoys working with patients to help them set up and accomplish their treatment goals.